When I was 9, (way back in 1970) there were certain promises that the talking heads on television made to me and those of my generation. We were promised flying cars, and jet-packs, bases on the Moon and Mars. A cure for the common cold they assured us was just right around the corner. Now don’t get me wrong here, there have been some wonder advances since I was 9 years old. Advances that none of the talking heads ever made. I was 20 when I bought my first personal computer, it was a Sinclair ZX81. It connected to my little color television and got 16 whole colors. It was smoking fast at 3.5Mhz and had one whole Kilobyte (64 K with the additional memory pack) of memory and a 300 baud modem. OK, so I did have to write every program myself that I used one it, or at least copy it out of a book line for line. I remember my first Cell Phone, I got it back in 2000(yea, I was a bit slow adopting the cell phone, I used to totally hate cell phones because they made it way to easy for my boss to get a hold of me and call me in to work on my day off), a Motorola Flip phone. Now the cell phone I have is faster and more powerful than the personal computer I had back in 2000. Yes my friends…. That is a spit-wad gun… No, not a squirt gun, not a Nerf gun, or not even one of those annoying do nothing but make noise guns, that is a genuine full fledged full on spit-wad gun. 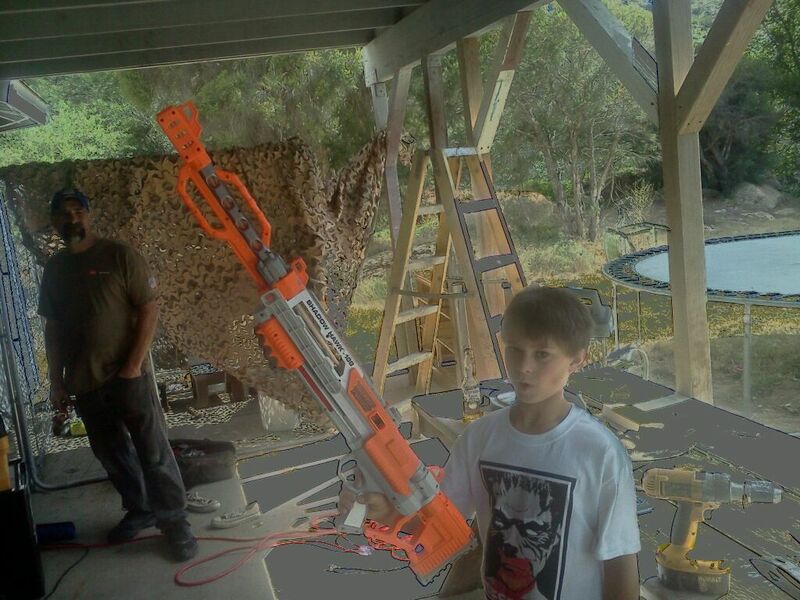 My 9 year old nephew is some thing like 4 foot 6 inches tall (I think, just guessing here) and yes that spit-wad Rifle is nearly as long as he is tall. It will shoot a spit-wad a good 25 feet. Yup, that thing shoots genuine spit-wads. It has an 8 round magazine, and is pump action to fire, and bolt action to advance the magazine to the next round. He cut’s up little strips of paper, puts them in water, rolls them up into wet soggy cylinders and loads them into the magazine. Then it’s all about… Zing…. Splat…. Zing….. Splat…. When I was 9, the apex of spit-wad technology consisted of… A carefully swiped straw from the school cafeteria. Oh how the time they have a changed. OK, so I’m 51 now, and my toys are a bit more complex than a Spit-wad rifle, my toys consists of, well my cell phone, an 800Mhz Smart phone, my desktop computer a 3.4 Ghz processor 8 Gigabytes of Ram and a 1 Terabyte harddrive, my 1984 Corvette and my 1996 BMW 328IC. Not exactly small potatoes, but then again, I’m not 9 years old anymore either. That was when I knew that I had officially become an old geezer and a Luddite. i wanted to yell at him… Get off my lawn you damned whipper-snapper… And I would have too, except that technically it was his lawn, since I was doing my weekend voodoo magic over at my brother’s (his father) house. I felt a petulant and childish urge to stomp my foot and angrily shake my fist at the world and scream… where the hell was my Spit-wad Rifle when I was 9… Except that I knew where my Spit-wad gun was when I was 9, it was concealed in my back pocket as I carefully made my way back from the cafeteria to class after lunch. ← It’s Tax increase, err I mean Fire season again in California…. Back when we were kids, spitwads were meleé weapons…. This was a pleasant surprise. Good to see you again, DG. Like the set up and the posting, too.